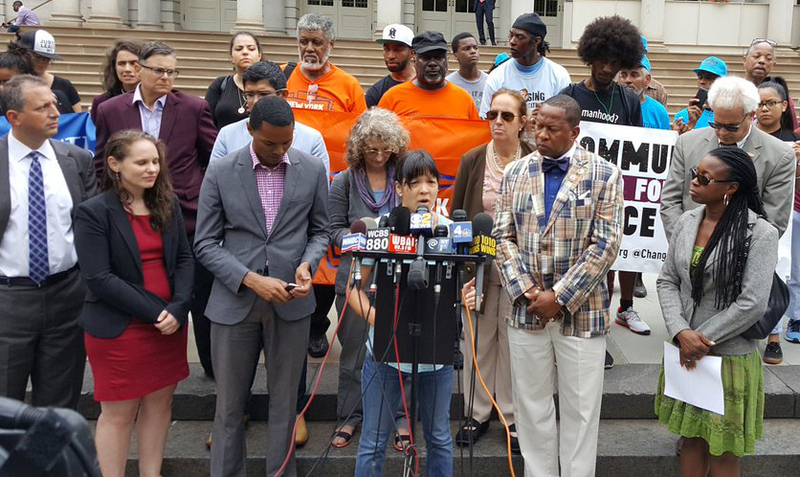 On Tuesday, September 6, 2016, dozens of community groups and elected officials filed amicus briefs to support a state court decision ordering the New York City Civilian Complaint Review Board to release the summary misconduct record of NYPD Officer Daniel Pantaleo, who killed Eric Garner. In filing the briefs, the organizations and elected officials opposed the city’s continued efforts to fight release of the information through appeal of a state court decision, which rejected the city’s argument that state law 50-a prohibited its release. Communities United for Police Reform filed its brief, signed by over 30 organizations and community groups, arguing that the de Blasio administration’s shielding of the records threatens community trust in government, access to such information has been critical to police reforms across the nation, and that the administration has taken an overly broad interpretation of state law 50-a contrary to its intent and past interpretation. A group of elected officials that included the New York City Council’s 19-member Progressive Caucus and 25-member Black, Latino & Asian Caucus (BLAC), Public Advocate Letitia James, Manhattan Borough President Gale Brewer and U.S. Representative Hakeem Jeffries filed their own joint amicus brief in support of the state court decision ordering the city to release the summary misconduct record of Officer Daniel Pantaleo and opposed to the city’s continued concealment. In July 2015, New York State Supreme Court Judge Alice Schlesinger ordered the release of a summary of misconduct findings against Officer Daniel Pantaleo (Luongo v. CCRB), which had been sought by The Legal Aid Society under the Freedom of Information Law. The de Blasio administration is appealing that decision, arguing that state law (50-a) that protects NYPD officers' personnel records from public release without judicial approval also should prevent the release of this narrow request of CCRB -- even though CCRB is an independent agency. The NYC Law Department's representation of CCRB raises conflict of interest and other concerns in this case, since the Law Department also represents the NYPD and officers in lawsuits. The Reporters Committee for Freedom of the Press also filed an amicus brief, together with 20 media organizations.